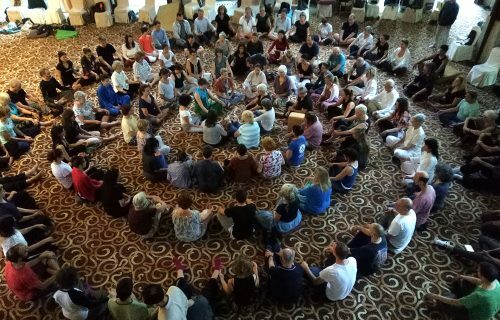 This article is about the report of the test and the observation of Zhineng qigong’s effect of qi field organization, using TP-CBS, the Cardiovascular Parameter Intact Measuring Instrument: a) Choose 28 people randomly from those who attend the qi-field organization report and test them before and after they attend it. Seven among them have a case history of high blood pressure and their blood pressures show a tendency of falling down after the qi field is organized. Most of their blood pressures become normal again. Four people whose blood pressures are low show a tendency of going up. The average value of 27 people’s blood vessel compliance rises and shows significant statistical difference (p＜0.01). b). Four tests on different occasions with 35 healthy young people of the same age group are conducted. The change in their cardiovascular functional parameter has not gone beyond the scope of normal physiological value and has no statistical significance. 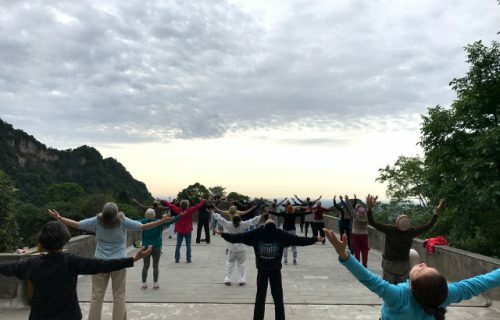 The result shows that organizing qi field in Zhineng Qigong has an effect of adjusting the balance of the human body’s cardiovascular functions. 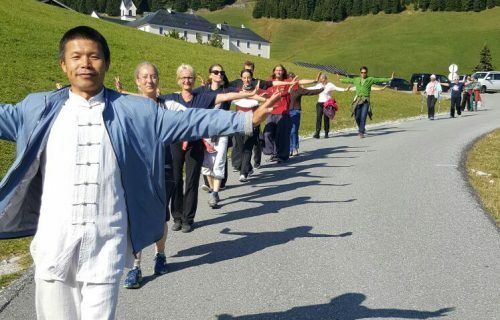 To teach qigong in a qi field organized and to achieve the effect of health care and healing disease to a certain extent during this process—this is an effective method promoted by Associate Professor Pang Ming in the recent years in his teaching of Zhineng qigong. Since there has never been specific and detailed record of this method in historical literature, it is very difficult to do textual research as to its origin. 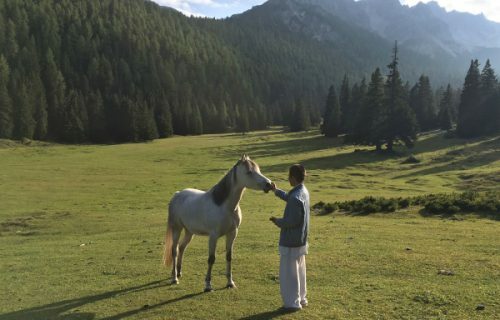 According to what is known, although the qi field organized by the qigong master is invisible and formless, people who are organized in the qi field can feel the effect of qi, and the effect of curing disease, of building up body as well as tapping wisdom and intelligence can also be achieved to different extent. We still can not provide qualitative and quantitative display of this qi field itself. However, the objective psychological effect produced by organizing qi field and by transmitting qi can be measured and evaluated from different aspects. We choose an easily operable, highly sensitive cardiovascular blood flow parameter measuring device that has no destructive effect. This instrument collects with sensor the pulse signal of the radial artery of the human body. According to the principle of the dynamics of blood flow and with computational analysis and processing, 14 blood flow parameters such as HR, SV, CO, SI, TPR, AC, K, V and one pulse wave diagram can be obtained for clinical analysis and diagnosis. People who take part in the experiment are examined for one time before they experience the qi field organization and are examined for another time or for more times after they have attended qi field organization in order to make a comparison. i. Preliminary experiments have been conducted twice. 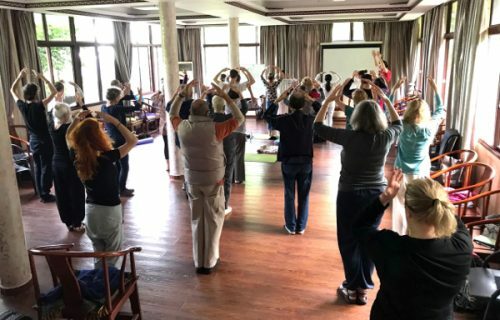 The first time: Zhu Zi, a Zhineng qigong instructor of the Qigong Association in TsinghuaUniversity, organizes the qi field for ten minutes for eight people including research workers. Then these people watch Zhu Zi do Xing Shen Zhuang model theactions for 40 minutes before they are examined. Result: heart function indices obtained after the qi field organization exhibit changes in different extent in comparison with when the qi field is not established. This tentative exploration shows that Zhineng qigong qi field organization has a certain effect on cardiovascular functions, and the instrument of TP-CBS is sensitive to these changes. The parameters above obtained in the test show that the cardiovascular functions of these people who have attended the qigong lecture in which the qi field is organized display obvious changes. Since these people show widely personal differences, few reverse changes take place in addition to the previously mentioned changes that occur in the positive direction. The statistics obtained above all go beyond the random change that can take place in a normal organic human body and is valuable for further exploration. We test some of the people (chosen randomly) who have attended the qi field organization lecture given by Associate Professor Pang Ming during the time when he is giving series of qigong lectures in Capital Stadium. Among these people, 16 are male and 10 are female. Their age: 13 are over 50 years old, 5 between 35 and 50, and 10 under 35 years old. Seven people among them claim that they have a case history of high blood pressure. The comparison of the changes that have taken place in the blood pressure of these seven people before they attended the qi field organization report (about 8:00am) and after they attended the report (8:30am to 11:30am, 2:00pm to 5:00pm) is shown in Table 1. From Table 1, it can be seen that most of the testees’ blood pressures that are high in their artery become adjusted and the condition of their blood pressure is improved. In addition, we have done medical science statistical processing about the statistics of the blood vessel compliance of 27 people among all the 28 testees. The average value of the blood vessel compliance in these people before the qi field is organized is 1.377ml/mmHg; the average value in them after the qi field is organized is 1.5719ml/mmHg. The average value improved in each person is 0.1948ml/mmHg (P＜0.01). This preliminarily shows that qi field organization in Zhineng Qigong has a positive effect on improving the performance of the cardiovascular compliance in the human body. The first time: Attend qi field organization lecture given by Associate Professor Pang Ming in Beijing Stadium. Condition and Method of the test is the same as those in the principal part of the experiment (ii). The second time: In Basic Medical Science Research Institute, conduct a test without organizing qi field and the blood pressure of each testee is compared with that of the testee himself or herself. The time to conduct the test is the same as that in the principal part of the experiment (ii). But the testees do not have any contact with the qigong masters in all their activities when the test is not finished on the day of test so that the basic parameters of these testees when they are not influenced by external qi can be obtained. The third time: Conduct a simulation qi field organization test in Basic Medical Science Research Institute. We invite Xing Ying laoshi (teacher) from Beijing Carder College of Finance and Trade Management to imitate Associate Professor Pang Ming and organize the qi field (After having listened repetitively to the recording of the instructions given by Associate Pro. Pang Ming as he guides Zhineng Qigong learners, she organizes the qi field according to the instructions that she has written down). The forth time: Invite Hao Yongxi laoshi, student of Associate Professor Pang Ming and instructor of the Xing Shen Zhuang GeneralCenter, to organize the qi field, with Wang Jingqin laoshi and Wei Xia laoshi giving support. According to the condition and the method in Experiment c, conduct comparative test in the same group of testees. The results of these four tests, after having been statistically determined, show that the changes in the testees’ parameters of the cardiovascular functions are not beyond the scope of normal physiological value no matter it is before or after the qi field is organized, or when a qi field is not organized, or before or after the simulation of qi field organization, thus having no statistical significance. Specific statistics is shown in Table 2 and Table 3.
gives us the following impressions. i. By comparing the conditions of the testees who have case history of high blood pressure (7 people) before and after they attend the qi-field-organization report, it is found that their blood pressures show a tendency of going down, most of which are restored to the normal scope. Testees chosen to take part in the cardiovascular function test are rather few (only 28 people) among the audience of over 10,000 people. As the samples of testees are completely taken randomly, with no specific inclination in the choice, the tendency of the change that have taken place in the indices of the testees’ blood pressures are comparatively unanimous. Sample of testees are taken randomly. Those who have the case history of high blood pressure show a tendency of decrease in their blood pressure; while those whose blood pressure is on the low side show a tendency of going up. Although the range in the increase and decrease of these people’s blood pressure has not all reached the indices that are appropriate with their age, tendency of improvement is displayed which is worth further thorough-going exploration. ii. Through repetitive tests with a group of healthy young people (35 altogether) at the same age group and compare the test result with the changes that have taken place in the blood pressure in those who claim that they have the case history of high blood pressure and those whose blood pressures are on the low side, we see that qigong qi field organization report (or lecture) seems to have a function of regulating the balance of the cardiovascular functions. It shows that it has an adjusting effect on the blood pressures that have deviate from the normal scope of physiological value. It can make them become normal or display the tendency of becoming normal again. Though the qigong qi field organization report has some effect on the healthy young people, the indices of these young people’s blood pressure show no sign of going beyond the scope of normal physiological value. The simulation of qi field organization with the 35 healthy young people is conducted in two weeks after they have received the qi field organized by Associate Professor Pang Ming. 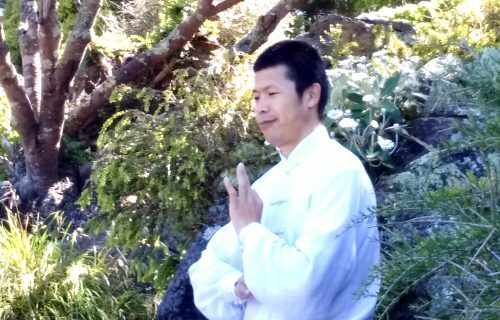 Although Xing laoshi has not practiced qigong before, he has repetitively listened to the instructions given by Associate Professor Pang Ming and conducts the qi field organization completely in the intonation of Associate Professor Pang Ming. 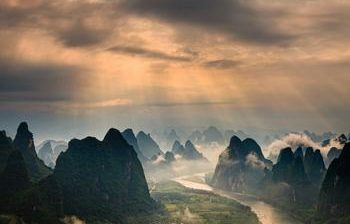 In order to successfully carry out qi field organization, we have to conceal the true identity of Xing laoshi before the qi field is organized. 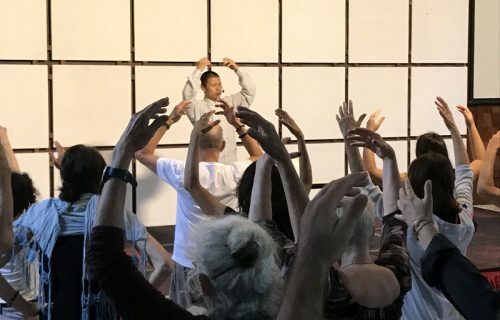 The testees who receive the qigong effect in a quiet room appropriately apply their consciousness inwardly with the instructions of Zhineng qigong. 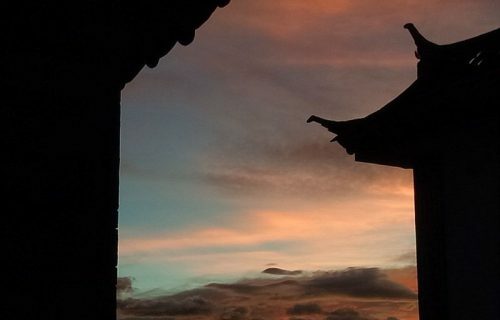 Changes have also taken place in some of the parameters of the testees and this just proves the importance of using consciousness in qigong practice. This article is only a summary of some preliminary observations during a short period of time. The preliminary impression obtained from the experiment is just for researchers’ reference.